It turns out that Maggie is a very accurate alarm clock…even on the weekends. If I don’t get up according to her internal clock, she will either come to the side of the bed and let me know it is time to wake up or she will jump up on the bed and put her front paws on me and continue the “time to get up quiet ruff”. As I head off to the WC to start the day, Maggie joins me to keep me on the path to her breakfast (she really loves her Stella & Chewy’s). 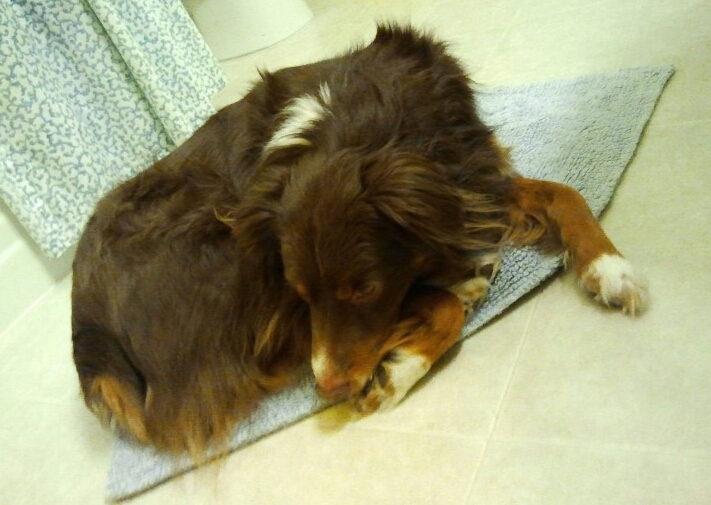 I always set the bath mat where I need it each morning and while I’m in the shower, Maggie turns it into a dog bed. She just lays there until I’m finished. When it is time to put it back on the edge of the tube, I have to tug it out from under her paws. This has become our daily routine and so far Maggie is winning the battle. Cute! One of my cats also likes to follow me on the morning routine: when my alarm goes off he jumps on my chest til I decide I really have to get up and push him off. He then joins me in the bathroom, hanging out on the back of the toilet or bath mat. For a while I got into the good habit of sitting quietly on the couch and meditating (only for 2 minutes, that is all my attention span can handle). He was so good about not bothering me during this time – just sitting on the back of the couch behind me, purring until I was done and ready to refresh his food bowl. I havent been good about meditating in quite a while and he seems to miss that. Perhaps I should try again for his sake! Sounds like your cat was meditating too. It is amazing how our furry friends get into a routine and then train us. Thanks for sharing your story here at the Garage!